As a teenager, I remember seeing movies like JAWS or STAR WARS and making the realization that they were 20 years old and made before I was born. As I watched INDEPENDENCE DAY for the first time in quite awhile, I was brought back to seeing this thing on opening night in what was probably a fire-code illegal theater in Woonsocket, RI. It has been 18 years since ID4 hit theaters, which is just crazy. 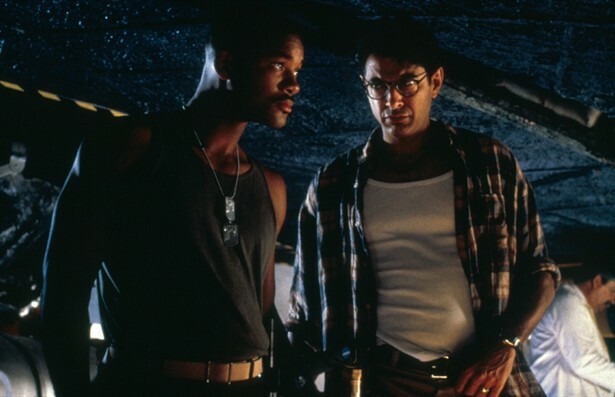 I watched INDEPENDENCE DAY (1996) on 6.18.14. It was, probably, my sixth or seventh viewing of the movie and first since I was a teenager. Roland Emmerich currently has a reputation for doing the giant sci-fi sprawling epic. When INDEPENDENCE DAY came out, he didn’t have such a reputation. His biggest films, to that point, were the more modestly scoped UNIVERSAL SOLDIER and STARGATE (though STARGATE certainly hinted at the ability to do a huge budget film). Without knowing this for a fact, Michael Bay must love INDEPENDENCE DAY. It is, basically, the movie he keeps trying to make when he makes another TRANSFORMERS flick. At the time, in 1996, Emmerich’s film set a standard for blowing things up in a realistic look way while adding in more humor than seemingly needed. Watching this film eighteen years in is interesting. The miniature models, of which there are more in this film than any other film in history, look good still today, even if some of the cars being blown up do look like toy cars. The first shot of the spaceship revealing itself out of the dark clouds is still breathtaking and impressive. What hurts this film, though, is the script. Emmerich’s films have long been knocked for having scripts which seem to fluffy for their material. INDEPENDENCE DAY is no exception. Standing in for character are generic archetypes of Jews, strippers, black culture, drunks, homosexuals, Hispanics, corrupt CIA guys, crazy doctors, and even aliens. Some of the actors are strong enough to overcome this. Will Smith, Jeff Goldblum, and Robert Loggia namely. Others, like Vivica A Fox as the stripper girlfriend, Randy Quaid as the alien abductee/drunk, James Rebhorn as the always-wrong politician, and Harvey Fierstein as the gay friend all do nothing more than just play the stereotype. The jokes are bad. If you cut six minutes of bad jokes out of this film you would have a much better movie. There are so many silly toss away lines at emotionally tense moments. They might get a chuckle, but they don’t show any restraint in considering story or pace over laughs. The plot has giant holes, culminating in the aliens being bested by a Macintosh computer (the idea of a virus defeating aliens is straight lifted from War of the Worlds, even if the style of virus is new). People meet up easily despite all the destruction and chaos. Most of the side stories have no emotional impact. Only Americans can do anything productive. The issues in the plot and the story go on and on like that. Yet, and this is important, none of that really matters. INDEPENDENCE DAY is a classic example of a movie which is fun if you drown your brain in popcorn and let it unfold in front of you. Many things tip the movie in that direction. Smith and Goldblum, as the hero and techie, drive this car well, with some decent assistance from Bill Pullman as the President. The action sequences are really fun, even if we have to wait more than 50 minutes for them to arrive. The destruction is on a large scale and the stakes in this movie are as high as could be. Everyone in the world goes along with the absurdity, where in some movies of this sort actors seem to be hedging their bets knowing they are in something less than artistic. This could be a better film. Making it so would make it a slightly better movie (assuming you define ‘film’ as the qualities of the filmmaking and ‘movie’ as pure entertainment). There are plenty of things which peg this as a 90s movie, particularly the computer technology, and the clothes, and the Hispanic kid who looks and sounds exactly like Keanu Reeves. Yet, because of the quality of the miniature effects and the commitment to action, this is not a film which feels particularly dated. If you haven’t seen INDEPENDENCE DAY it is a landmark summer blockbuster movie, even if it is not as good a film as some of its cousins. If you haven’t seen it in awhile you may find the holes a little more glaring, but you’ll still have much the same fun you did when you saw it as a kid. The bonus point is for the miniature model destruction. It really does take the movie to another level. ~ by johnlink00 on June 19, 2014.